Krypton is an American 60 minute scripted science-fiction television series, which kicked off on March 21, 2018, on Syfy and is broadcast every Wednesday at 22:00. The show is currently in its 2nd season. Syfy has officially confirmed the renewal of Krypton for Season 3. The exact release date is yet to be announced so far. Sign up to track it down. Set two generations before the destruction of Superman's home planet, Krypton follows Seg-El, the legendary Man of Steel's grandfather whose House of El was ostracized and shamed. With Krypton's leadership in disarray, Seg-El encounters Earthly time-traveler Adam Strange who warns he's under the clock to save his beloved world from chaos. Fighting to redeem his family's honor and protect the ones he loves, Seg is also faced with a life and death conflict save his home planet or let it be destroyed in order to restore the fate of his future grandson. May 22, 2018 -- SYFY today announced a second season pickup of KRYPTON, the untold Superman story based on DC characters from Warner Horizon Scripted Television. 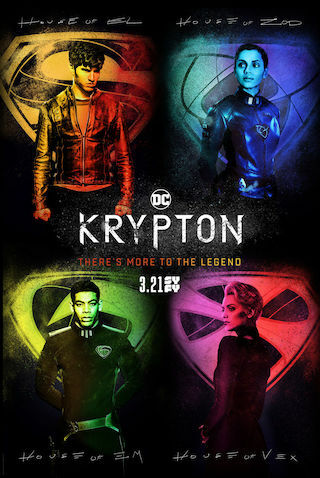 KRYPTON, which has averaged 1.8 million viewers L3 per week to date, is SYFY's most-watched debut season among total viewers for an original series since Ascension in 2014, and the most-watched season for any scripted series on the network since Defiance in 2015. With the can't-miss Season 1 finale airing this Wednesday, May 23 at 10/9c, KRYPTON's second season is expected to return in 2019. With this pickup, KRYPTON joins an upcoming SYFY lineup that includes returning originals HAPPY! starring Christopher Meloni and Patton Oswalt and returning for a second season in 2019.